​Tree damage due to storms can be devasating, especially when caused by strong storms and ice. Such tree damage can be a nightmare for property owners, creating both landscape and building damage. For most business and homeowners, the extent of tree damage is beyond their ability to clean-up. Further, oftentimes, most local area tree service companies in Allentown will be booked for weeks causing many property owners a significant delay in getting things cleaned up. To add insult to injury, some tree companies will price gouge by inflating their prices during these boom times for their business. 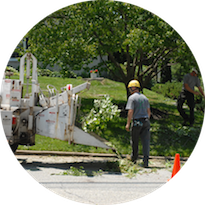 However, at Allentown Tree Service we are both fully staffed to cover these extenuating situations; and we are honest and fair in our pricing - we never inflate our prices during storm tree damage periods. We provide this service 24x7 and seven days a week to be as responsible as possible, and we always price our work as we would during normal periods. The moment you experience storm tree damage, call us for a free and responsive estimate. We will come to your home ASAP and provide a quick estimate of the restoration project. During our estimate meeting, we will provide a complete quote for cleaning up all broken branches, downed and uprooted trees as well as for all the ancillary services such as wood chipping and removal. We will provide this estimate to you both verbally, on the spot, as well as in writing accompanies with our insurance and licensing documentation. If you select us, we will have a team immediately dispatched to your property and starting to work within hours, or at the most 24 hours. We will treat you fairly during both the estimate process as well as during the restoration efforts. We can haul all the wood away or we can cut it into usable sections for your later use. We will also stack it at your designated location. Tree storm damage can be a disaster for most property owners, who are generally ill-equipped to handle such large-scale tree work. Don't waste your time and money, let alone safety, in trying to clean-up such a mess yourself. Call Allentown Tree Service whenever you have tree damage that exceeds your DIY capabilities. Dealing with large broken and/or downed trees can be dangerous work - let the professionals handle it. We are fully licensed and insured for just these situation. What would take you weeks of hard work to complete, if you could do it at all, will take us only a matter of hours. Further, we can much more easily deal with all the salvage wood that will result from such a clean-up effort. ​During these emergencies, you may not think you have much choice in tree service companies in Allentown. However, you do with us - we are fully staffed and able to take on much more workload than our competitors. You don't have to be at the mercy of the only tree service company that has time for your job. Instead, call us to provide a free, fair and professional estimate that is in line with all of our normal pricing. You never have to be held hostage during a storm damage situation. Naturally, we also off a 100% satisfaction promise on all of our tree work, to include tree damage services.